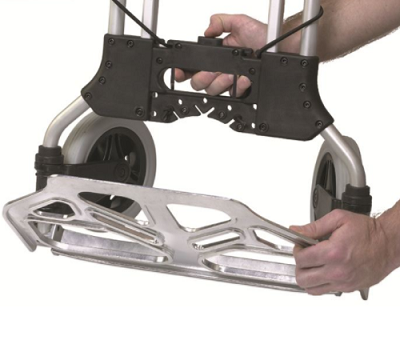 The Maxi Mover is a 12lb lightweight aluminum folding hand truck that is strong and compact. It can carry up to 250lbs and then fold up into something roughly the size of a large coffee table book! The Maxi Mover hand truck is incredibly easy to use and comes with a comfortable hand grip and a large nose plate so you can really pile things on. This lightweight hand truck is something that you will want to use everyday—carry your garbage out, carry your groceries in, or move furniture or small appliances from place to place. It has 7” wheels that are durable and strong. It has tough elastic straps to keep your items securely in place. 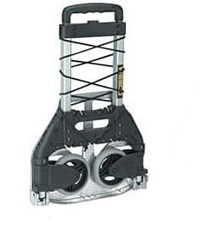 You might like this similar Wesco Mega Mover folding hand truck. Check out and compare all of our folding hand carts. Handtrucks2go is the best place to go whenever you need a quality hand truck. This product is just what it says it is: compact, heavy duty, and easy to use. The handle is a little shorter than might be desired, but understandable given practical limitations. It is a welcome alternative to hauling around a full-sized dolly. This hand cart was allot more expensive than the magna cart and looked basically similar. I was a bit hesitant to buy it at first but after looking at the reviews I decided it was worth it. I think I made a good decision, it seems like a high quality cart that will last a long time. Great product!!! For moving computers around. The Maxi Mover is an amazing product! Light enough for anyone to be comfortable using and easy to fold and store. 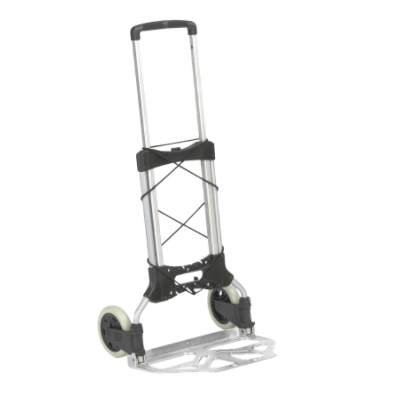 Great for a number of uses so itâ€™s the best all around hand truck. Would definitely recommend! Extened demensions 42" x 19" x 19"
Folded demension 29.5" x 19" x 2"
Wheel Sixe 7" x 1.5"